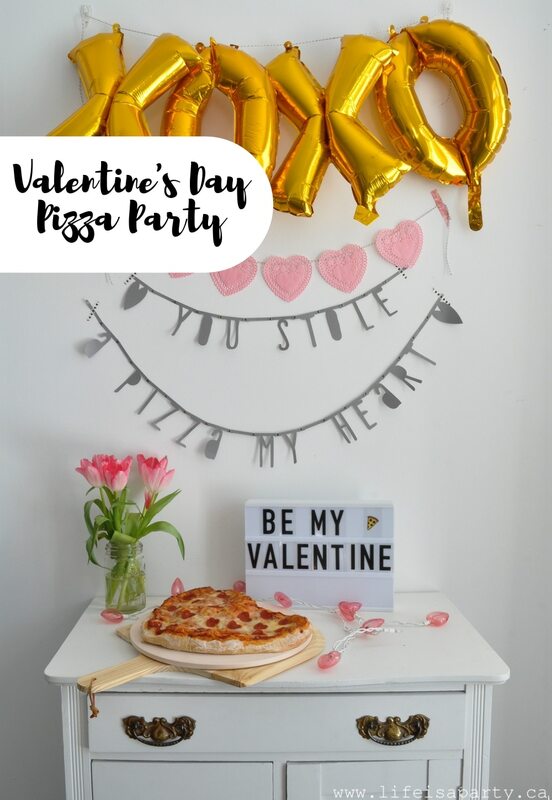 Valentine’s Day Pizza Party -DIY decorations, heart shaped pizza, mocktails, and a dessert pizza recipe make this the perfect family celebration. Going out for a romantic Valentine’s day with your sweet heart can be fun, but then again… crowded restaurant, overpriced meal, finding a sitter. 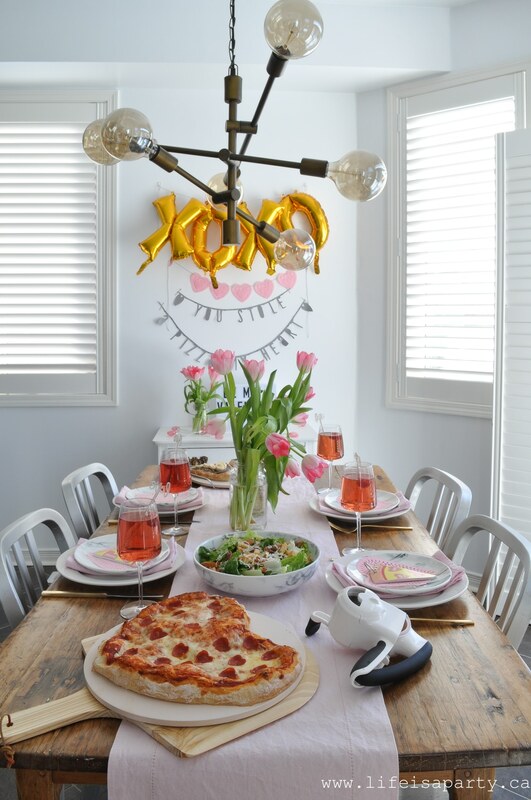 So maybe a fun Valentine’s Day Pizza Party for the whole family is an even better idea. 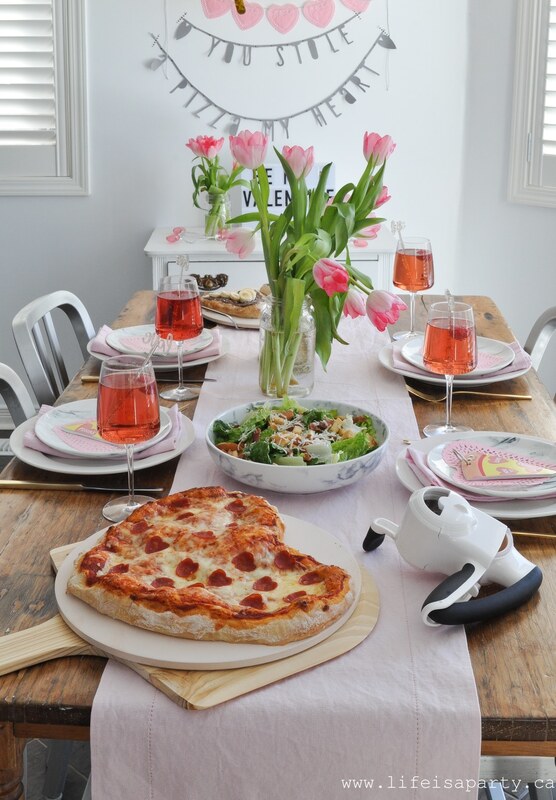 Pizza is an absolute favourite around here, loved by all. 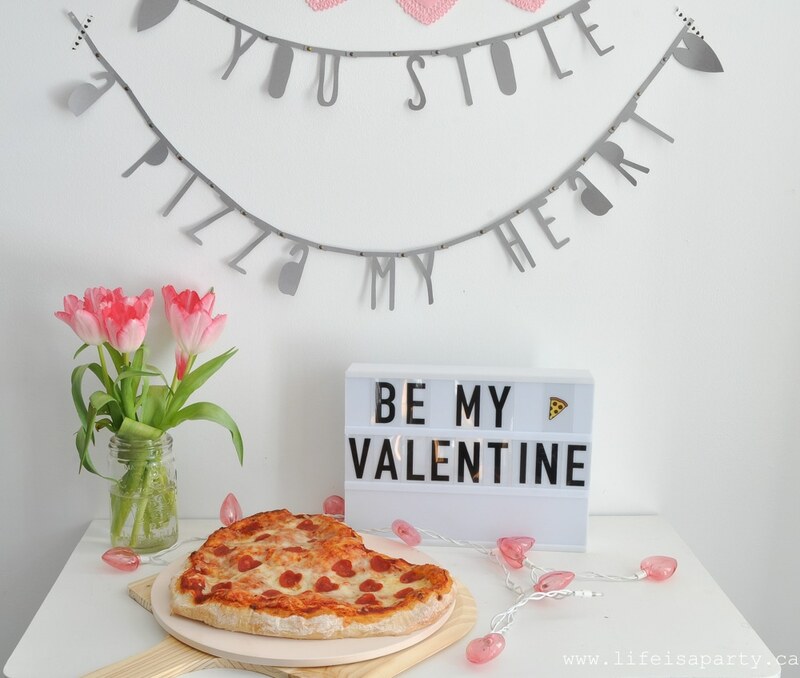 For Valentine’s Day we decided to make things extra special with heart shaped pizza to celebrate! To help us celebrate we set the mood with a few simple decorations. We picked up some X and O balloons at the party store. I also made a cute little bunting with some pink paper heart doilies strung together with some baker’s twine. 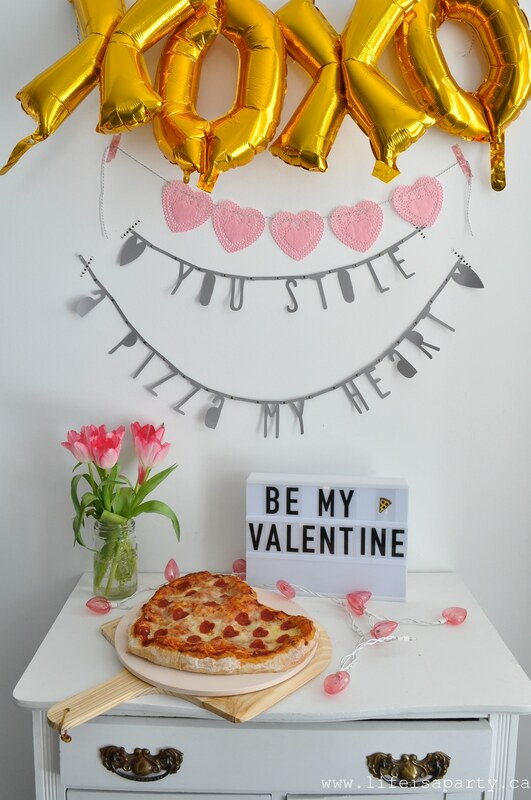 My favourite bunting is the “You Stole A Pizza My Heart” one. I made it on my Cricut cutting machine -and you can find the free cut file to make your own here. I made it out of some grey card stock. Each letter is attached to the other with some small brad fasteners. I hung it with a little washi tape and I love how cute it is. 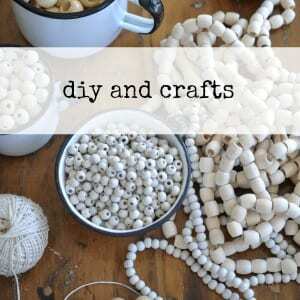 If you didn’t have a Cricut machine, you could create something similar with a little chalkboard or a letterboard. 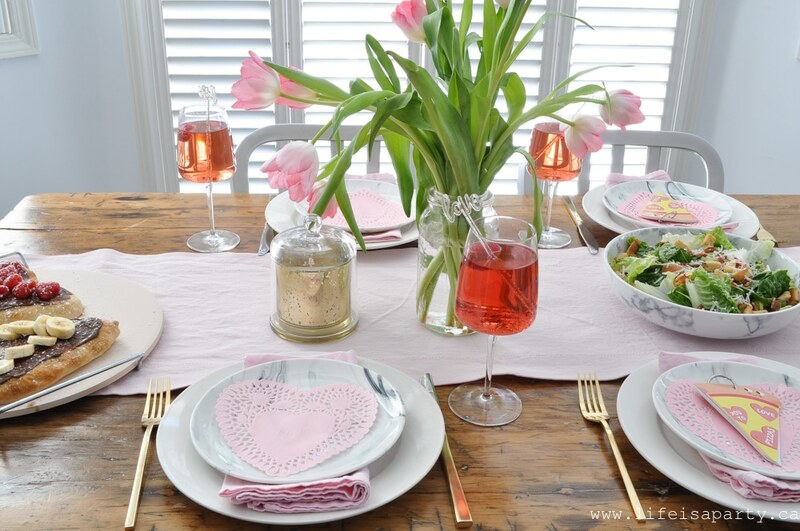 On the table we kept things fairly simple with a pretty pink table runner and some tulips. 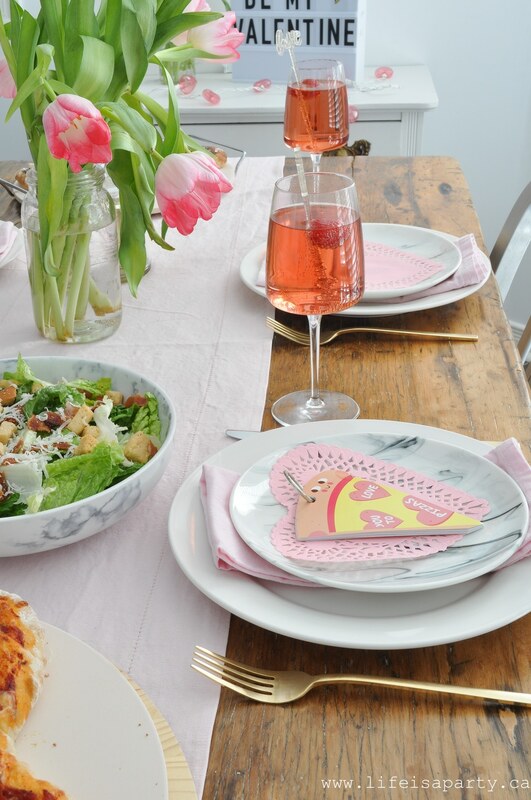 For each place setting, I used another pink paper doily. And for my girls, I picked up a little present at the craft store -it’s a pizza shaped little sticker book and was too perfect not to get for them. 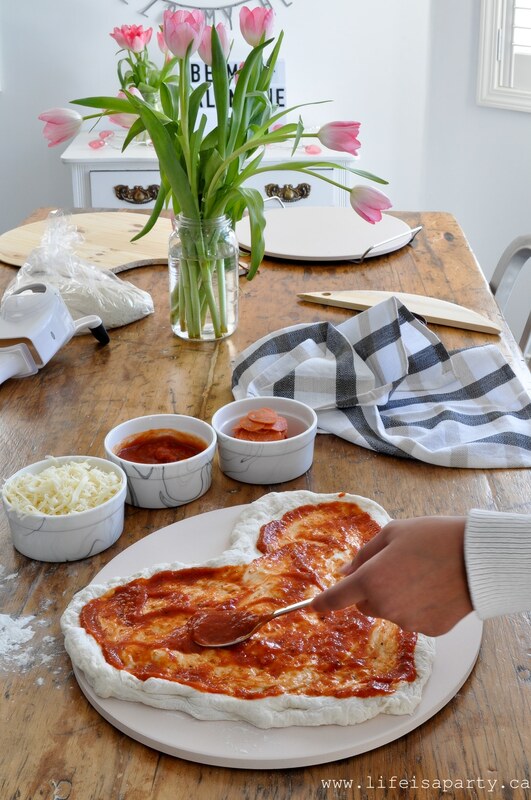 We love a little homemade pizza around here. 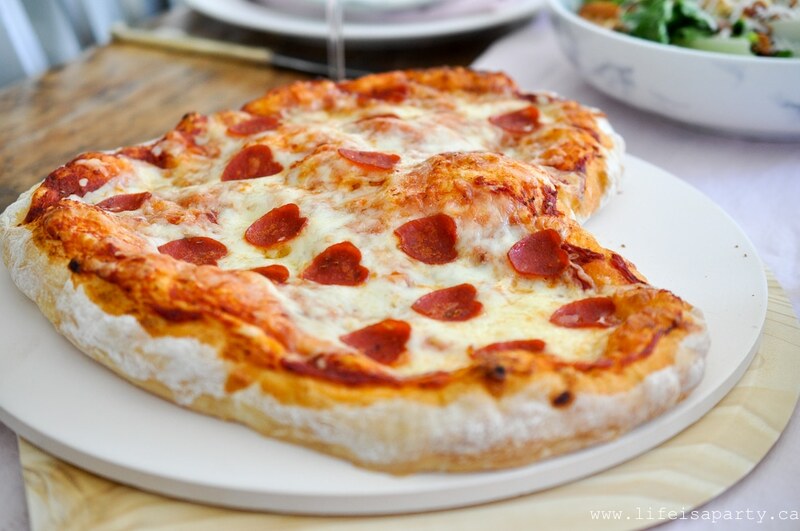 And we kept this one really simple with store bought pizza dough. 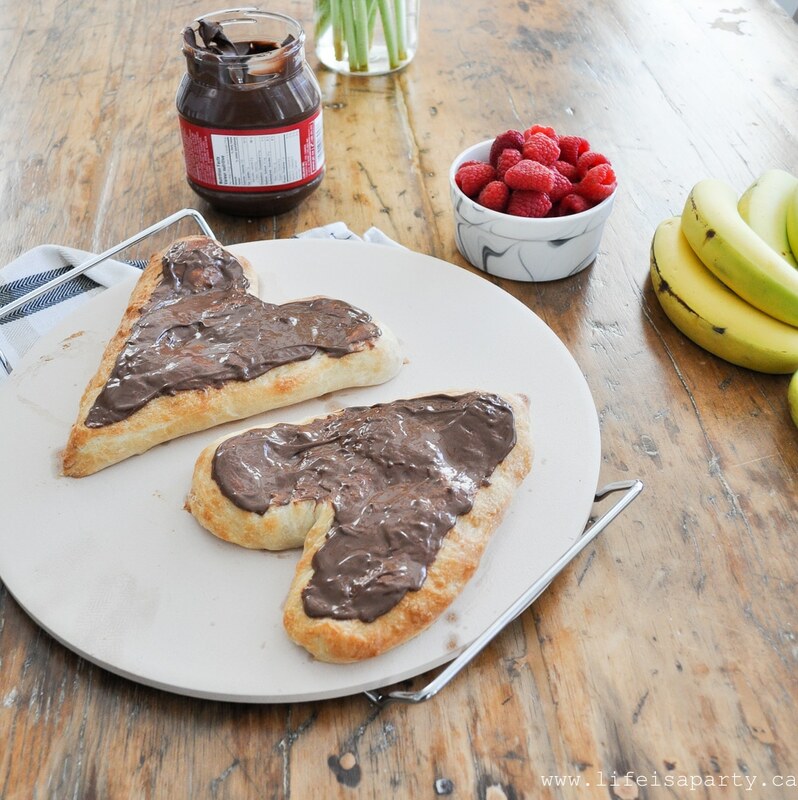 I shaped it into a heart shape to make it extra special. 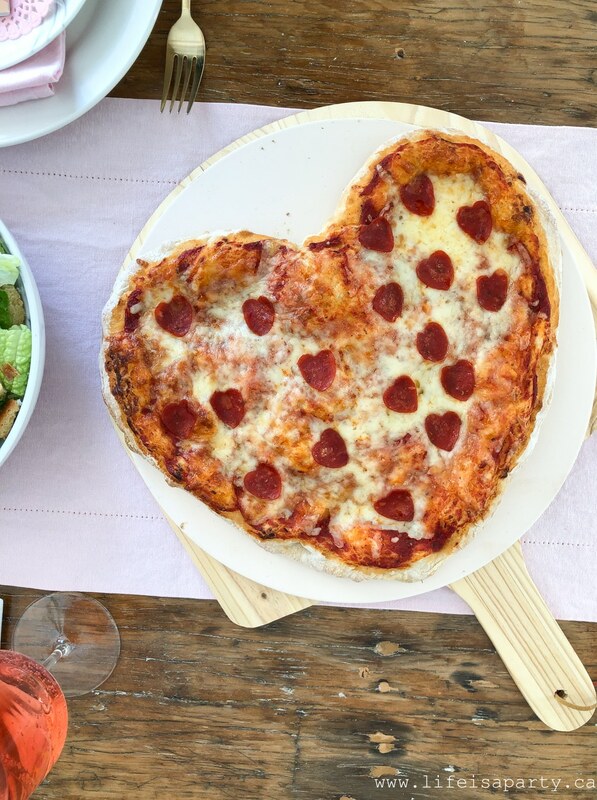 We also used a little heart shaped cookie cutter to cut our pepperoni into hearts too. 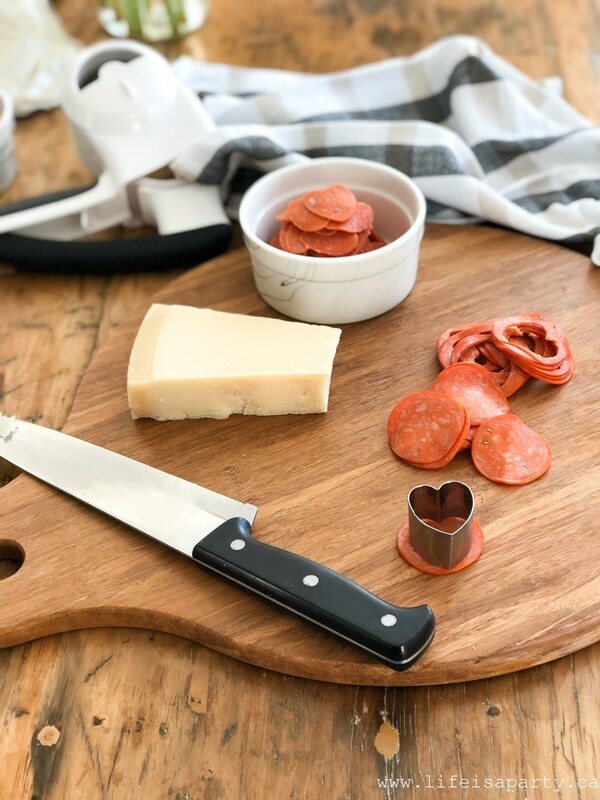 We kept the pizza itself really simple with just pepperoni, but you could add any of your favourite toppings. 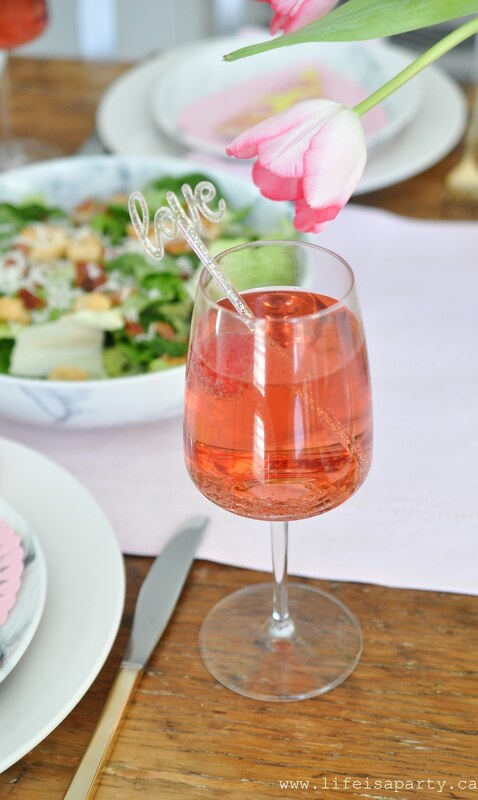 To make thinks extra special, we broke out some pretty wine glasses, and made mocktails. For ours we combined some ginger ale with some cranberry-raspberry juice, and garnished with a fresh raspberry. 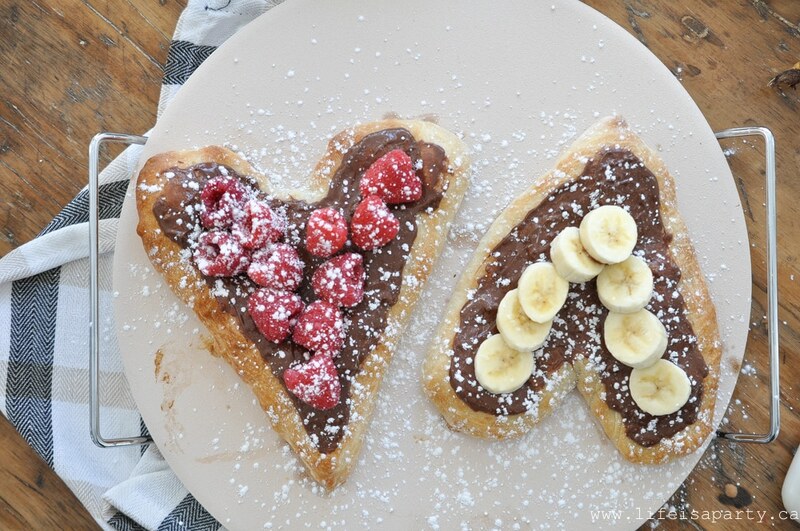 Since Valentine’s Day practically requires dessert, I decided it would be fun to make some dessert pizzas too. 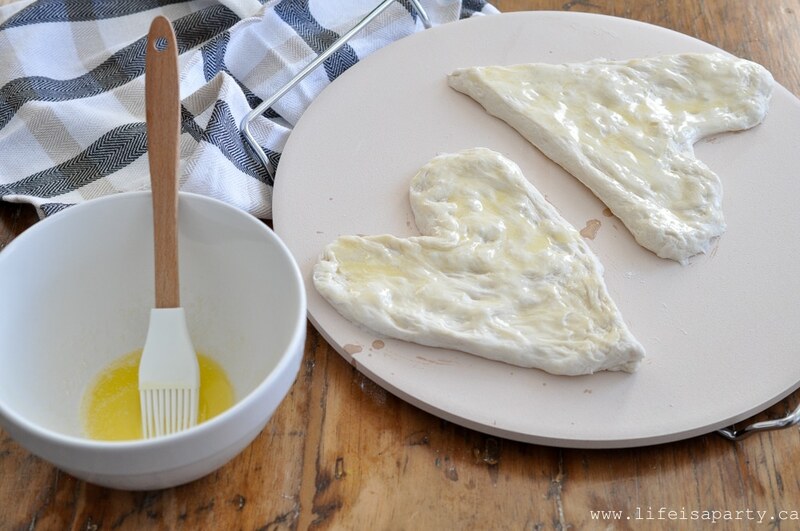 Cut a regular sized package of store bought pizza dough into quarters, and stretch each piece into a heart shape. So you will have 4 individual dessert pizzas. Brush the dough with some melted butter, this will make the dough brown really nicely. Bake the dough at 425 F for about 8-12 minutes until it's golden brown. 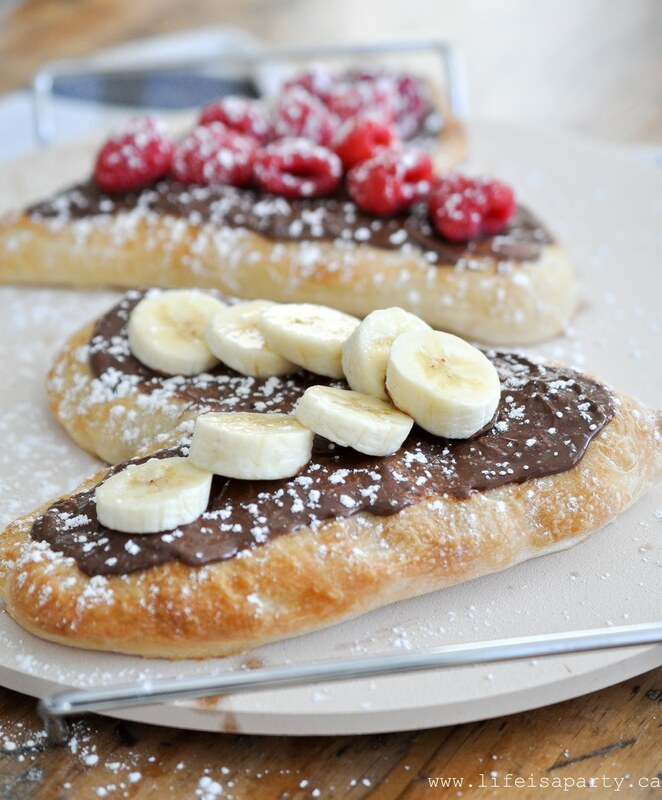 Let dough cool slightly and then top with Nutella. 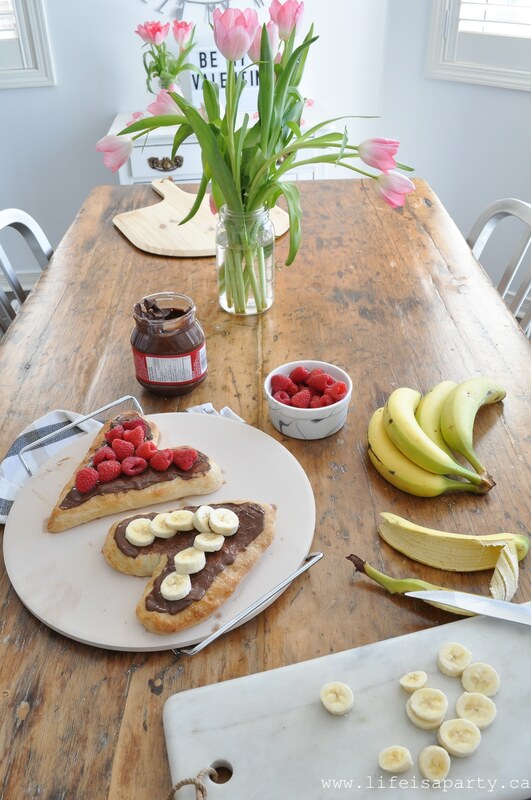 Then add fruit on top, we used raspberries and bananas, but strawberries, kiwi, pineapple, or others would be great choices too. 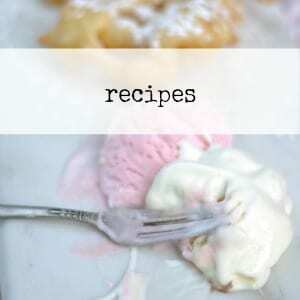 Optional: garnish with a sprinkling of powdered sugar. I think the dessert pizza just might have been the hit of the party. We had a lot of fun with our little family party, and I hope it inspires you. 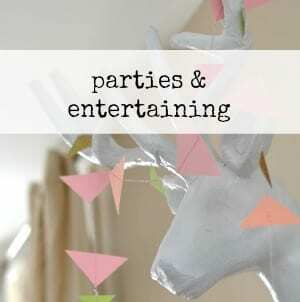 Even if you’re planing on going out or celebrating with just your spouse, you might consider doing something fun like this with the kids as well. 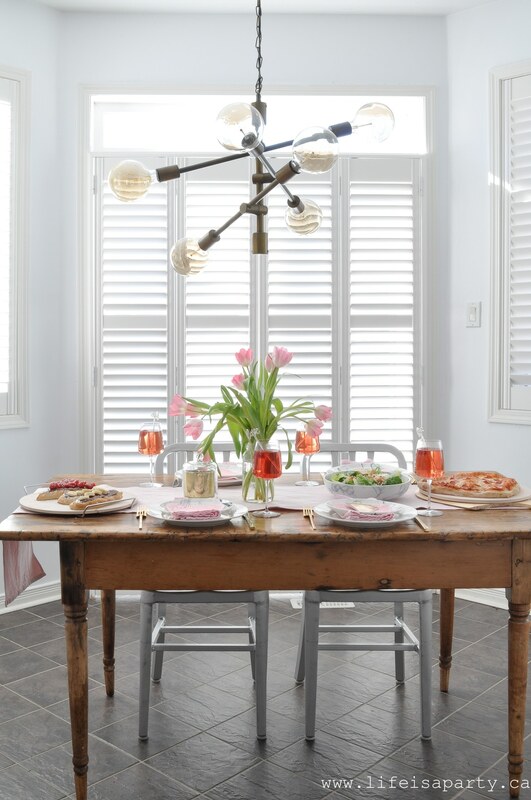 This little party, is even easy enough to pull off on a busy weeknight. 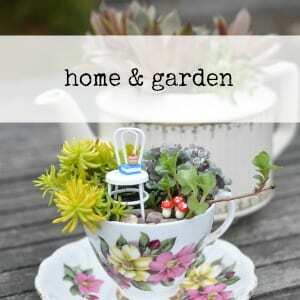 Make it as simple or as fancy as you like. Putting this together reminded me of a favourite childhood memory. I might have even shared it here before. 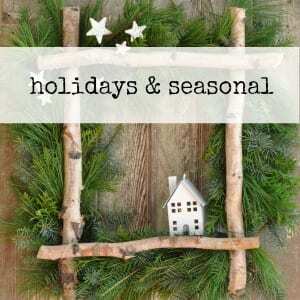 I didn’t grow up with parties, or a big fuss for every holiday. But one year when I was little we had a snow day around Valentine’s Day. My dad still went to work, but mom was at home full-time then, and my brother and sister and I spent the day with her. She decided to bake with us. We walked to the little corner store and bought a cake mix and some cherry liquorice. My mom wanted to make a heart shaped cake with us. We didn’t have a heart shaped cake pan, but she’d seen in a magazine that you could use a square cake, and circle cake cut in half to make a heart. We made our cake, iced it with fluffy pink frosting, and decorated it with the liquorice so that it looked like it was stitched around the edge of the heart. And we proudly all had it for dinner that night. It wasn’t really that big of a deal. We just used a cake mix, and she was probably just trying to keep us busy. It didn’t even take all day. But, truly it’s one of my happiest memories of growing up. It’s amazing the impact a little heart shaped treat can have. 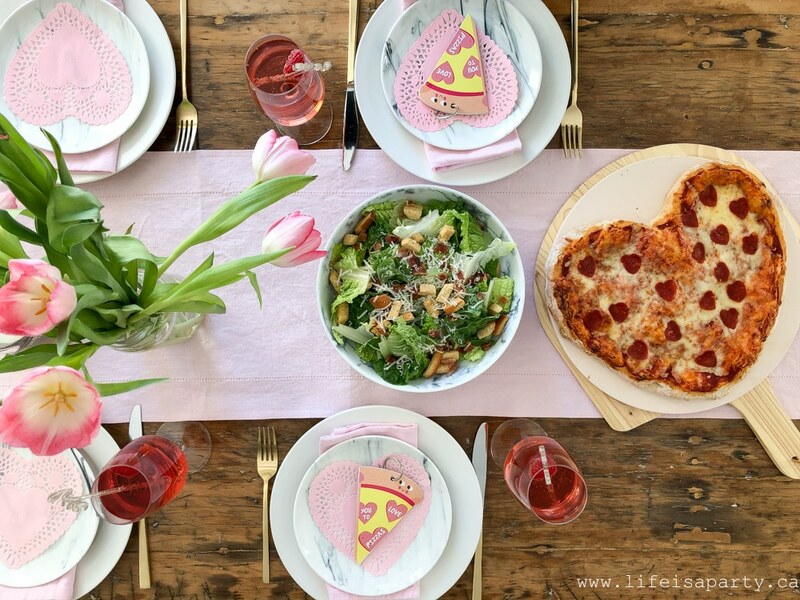 With a Valentine’s Day Pizza Party, life really is a party!